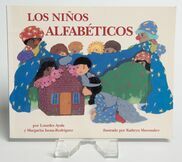 ​Los Niños Alfabéticos is a book written in Spanish that uses brief stories, along with brightly colored images, to teach children the Spanish alphabet. This book uses alliteration to reinforce a different letter of the alphabet on each page in a way that appeals to young readers. For example, the story about the letter M includes Miguel Montes, mono, moto, montado, melons, mama, and mercado. This paperback was given to MOTAL in 2006. Donor Suzanne Muhaidly wrote, “This book represents the early 1990s in California. It was a time of bilingual education and of teaching to students in their primary language.” Suzanne was a kindergarten teacher at the time, and she was selected to teach a bilingual class because of her ability to speak Spanish. She read the book aloud to her class, showing them the colorful pictures and pronouncing the many words with care. Questions surrounding bilingual education have been an issue since the founding of the United States. From the 1700s through the late 19th century, many regional areas of America taught students in German (in the Great Lakes areas); French in the Louisiana Purchase region; and Spanish after Texas, Florida, and California were acquired from Spain. Before the English took over New York from the Dutch, there were 18 languages spoken in Manhattan, where children were taught in their native languages. As an example, the Articles of Confederation were published in English and German. Increasing immigration from 1880 to 1920 led to a strong sentiment for American assimilation, and English-only education became the norm. Students were often forced to repeat grades until their English was proficient. After the 1898 Spanish-American war, people in Puerto Rico, Hawaii, and the Philippines were required to learn and be instructed in English only. Bilingual education came back into California schools after the 1974 Supreme Court case Lau v. Nichols. Bilingual education was then the standard in the state of California until Proposition 227 passed in 1998. Prop 227 was commonly known as the “English-Only Initiative.” After its passing, most classrooms returned to English instruction. However, legislation permitting bilingual education was passed in 2017. One can assume that the issue will continue to be explored and debated. Ongoing immigration throughout our world will always present a need for receiving schools to accommodate speakers of foreign languages. Many agree that learning to speak two—or more—languages is an exciting, desirable goal for people of all ages.